What can be more thrilling and adventurous than the sound of stampeding bulls behind you? 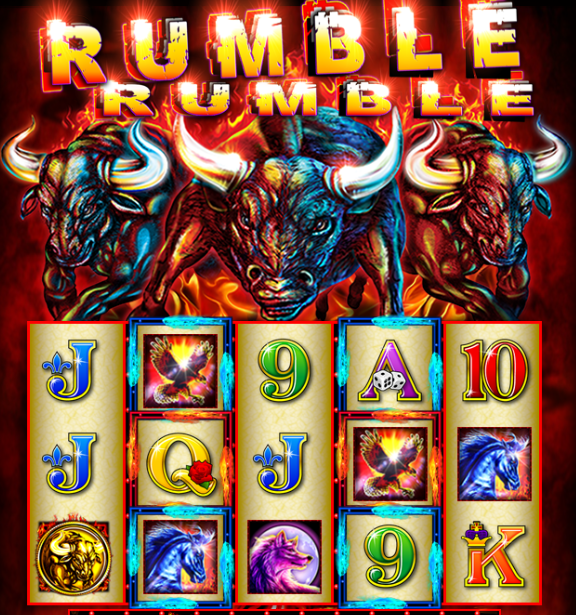 Well, converting that thrill into an advent slot game, Ainsworth Gaming has brought in this spectacular game called Rumble Rumble. This 5 reel slot game has no less than 100 paylines which you can use to score some good winnings. This video slot is one of the most popular slots provided by Ainsworth. With basic features and a decent plus easily understandable gameplay, the slot game features some flashy and eye-catching animal images particularly the bulls. The theme of the game in itself is the one that’ll keep your adrenaline rush on point. With the sound of the flaming wild bulls running behind you, you’ll get to enjoy some amazing gaming experience. 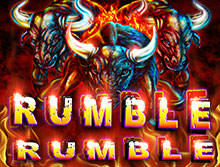 Rumble Rumble holds a decent RTP of 94.08% which might not be as high as the other slot games but the reason for it is its simplicity and low difficulty level. It is a game which you’d like to play when in the mood to play a good basic slot game. With some assumable payline structures, the game still manages to offer every possible feature that can be given by a basic slot game. Talking about the winnings part, the maximum win which you can score in the game is 100 times the amount of your bet which is pretty amazing. The minimum bet that can be raised is £1 and the maximum bet is £75. Stampeding animals is what you can expect from the graphics of this slot game. The game has some bright and attractive colors which will keep your interest rightly focused on the game. The game took birth as a land-based casino game, and hence, even on the online version, the overall look of the game and is conduct is kept resembling the original one that is straight and simple. The backdrop is plain white along with some gorgeous bright animal symbols popping up on the reels. The symbols are split into two parts, high paying, and low paying symbols. The high paying symbols on which you should keep an eye while rolling the reels include a moose, a stunning black horse, a graceful prairie dog, a flying eagle, and a rock face. All the symbols are filled with bold colors and a neon edge that makes them outstanding. There are low paying symbols as well, which are represented by playing cards as normally in other games. The wild symbol is represented by a fireball. Scatter symbol can be spotted as gold coins. The function of wild and other bonus features are as mentioned in the next part of the article. Wild symbols: Amongst some basic slot game bonuses provided by Rumble Rumble, you can seek out for the wild symbol to earn a decent winning. The symbol is represented by a flaming bold text which says “WILD”. It is the symbol that acts as a substitute to any other symbol present on reels except the scatter symbol. Another interesting fact that you should know is that you receive a bull symbol on your 2nd and 4th reel or even either of the two outlined with a bluish square around it, each and every symbol present on that particular reel will transform into a wild symbol. This will increase your chances of hitting the winning paylines. Scatter Symbols: The scatter symbol can be spotted on the screen in form of golden colored coins. If you find them on your reels, you’ll be eligible to earn scattered winnings. You can even end up with winnings starting from 1x to a maximum of 100x through these symbols itself. A not so common fact that you need to know is that sometimes, you might even spot one of these scatter coins with wild written on them. On such occurrence, the two become scatter wilds thus facilitating bigger winnings. Free Spins: This is the main bonus feature of the game. To trigger this one, you need at least 3 of the scatter symbols on your reels. If you land up with three or more than three scatter symbols you’ll be taken to a separate screen with different reels where you can use the free spins. In the beginning, when you start with the bonus, you get a total of 8 free spins. Further, this can be retriggered if, during one of the free spins, you land 2 more scatter symbols on your reels. This will keep adding to your free spins and hence will end once your spins finish up. Rumble Rumble is a decent game if you are a beginner in slot gaming or even if you need a basic relaxing game to spend some quality time gaming. Overall, as per its conduct, the features it provides and maintains are better than any other basic slot game of this level.